Duane Oyer holds his award for being named the Tennessee Wildlife Resources Agency Fisheries Biologist of the Year. 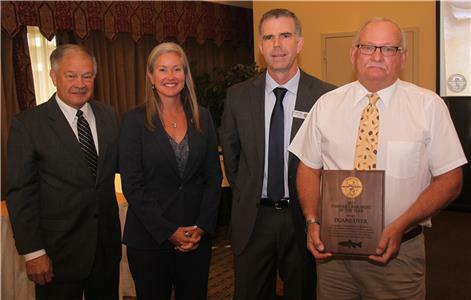 He was presented the award at the September meeting of the Tennessee Fish and Wildlife Commission. He serves as the manager of Buffalo Springs Hatchery in Grainger County. Also pictured (from right) are TWRA Executive Director Ed Carter, TFWC Chair Jamie Woodson, and Fisheries Division Chief Frank Fiss. Duane Oyer and Rob Theurer have been honored by being named the Tennessee Wildlife Resources Agency’s Fisheries Division’s biologist of the year and fisheries technician of the year, respectively. 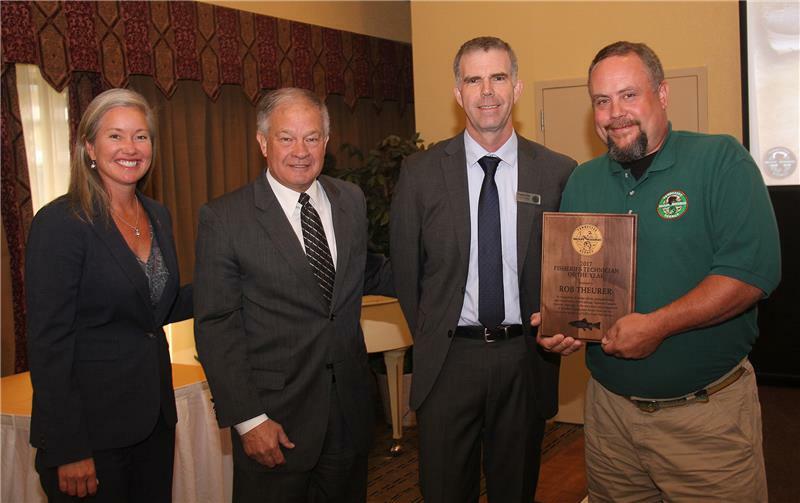 The recipients of the award were announced and introduced during the September meeting of the Tennessee Fish and Wildlife Commission held in Gatlinburg. Frank Fiss, TWRA Fisheries Division chief, made the presentations. Mr. Oyer serves as the manager of Buffalo Springs Hatchery in Grainger County in TWRA Region IV. Mr. Theurer serves on the Tellico Hatchery staff in TWRA Region III. A native of East Tennessee, Mr. Oyer began his career with TWRA in 1975 following his graduation from the University of Tennessee with a degree in forestry and wildlife management. He worked as a fish culturist at Buffalo Springs for five years before becoming a wildlife manager in 1980 working in both fisheries and wildlife programs. In 1986, he was promoted to manager of Buffalo Springs, a position he has held ever since. During his tenure, he has overseen many hatchery improvements and upgrades through the years. These include a new water supply line, new raceways, and the liquid oxygen system, all of which have improved the hatchery’s overall production. He recently took over the responsibility of re-establishing the stocking program for the West Prong Little Pigeon River. In addition, he provided much-needed assistance to the city of Gatlinburg with its trout program that was significantly altered when the trout facility was damaged by the wildfires in late 2016. He continues to routinely provide fish for special events throughout the years. A youth fishing event is held at the hatchery each year. Mr. Theurer joined the TWRA in 1994. His years of experience in hatchery operation enables him to perform and teach other staff members the processes necessary to produce and maintain healthy fish populations in a cold water hatchery. At Tellico Hatchery, he contributed in numerous ways to help the hatchery run smoothly. He used his fabrication skills to repair the intake and construct an elevated catwalk to allow staff access to safely remove debris. He is also playing a critical role in the design and operation of low head oxy-generators, and degassing columns to provide better water quality. He also designed and constructed the beds of the hatchery’s new stocking truck. Rob Theurer holds his award for being named the Tennessee Wildlife Resources Agency Fisheries Technician of the Year. He was presented the award at the September meeting of the Tennessee Fish and Wildlife Commission. He serves as a fisheries technician at Tellico Hatchery. Also pictured (from left) are TFWC Chair Jamie Woodson, TWRA Executive Director Ed Carter, and Fisheries Division Chief Frank Fiss.